Ashgate is the first publishing house to focus specifically on the field of art historiography through its series Studies in Art Historiography. 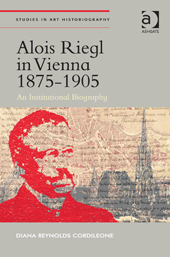 The first book to appear in the series is Diana Reynolds Cordileone’s Alois Riegl in Vienna 1875–1905: An Institutional Biography, which looks at how Riegl’s art historical work was shaped by factors outside of the academic milieu. Riegl was originally a museum curator before becoming a member of the University of Vienna’s prestigious Institute of Art History and in both jobs he was an imperial employee. In his museum work he strove to meet the demands of Austria’s growing textile industry and also expressed views on state policy regarding conservation. In his university lectures Riegl emphasised the importance of a truly scientific approach to art history in opposition to the popular taste for dilettantism and belles lettres. Throughout his work he was concerned with the importance of art for life, generated by his encounter with the ideas of Schopenhauer and Nietzsche in a German-national student club, Leseverein der deutschen Studenten Wiens. The series is concerned with art history as a living practice written by individuals and subject to the more general demands of institutional structures. In this respect it is distinct from traditional approaches that centre on the theories of major art historical figures, the staple diet of student textbooks. It seeks to reinvigorate the field by paying close attention to the ‘what’, ‘how’ and ‘why’ of art historical writing and is intended to supplement the work of the Journal of Art Historiography, which has been described by the online Dictionary of Art Historians as ‘the major research organ of the field’. Two more books are scheduled for publication in 2014: Victorian Perceptions of Renaissance Architecture by Katherine Wheeler, in April, and A Theory of the Tache in Nineteenth-Century Painting by Øystein Sjåstad, in December. Further down the line are The Expressionist Turn in Art History – A Critical Anthology edited by Kim Smith, in early 2015 and Mariette and the Eighteenth-Century Science of the Connoisseur by Kristel Smentek in Winter 2015. Others are being considered for contract and yet more are waiting clearance review. Guidance for potential authors is given at the Journal’s website, which should be browsed for a sense of the difference between ‘art historiography’ and ‘art history’. Any enquiries concerning the series’ scope should be addressed to its General Editor,Richard Woodfield.